Members of Littlehampton Flower Club produced colourful and innovative floral designs for an exhibition to celebrate its 60th anniversary. The last time the club put on anything like this was ten years ago, for the golden anniversary, so it really was something special. The 60 Sparkling Years exhibition featured five class titles, which were interpreted in many different and interesting ways by a number of members. Secretary Glynne Collins said more then 80 visitors were welcomed to Littlehampton United Church Hall on Saturday for the exhibition, the final event in the club’s diamond anniversary year. She added: “Anniversary Party was a buffet table style with many entries, Sparkling Wine was a petite arrangement in a wine glass, Around the World enabled the visitors to see how flowers and accessories can interpret another country, Crowning Glory allowed exhibitors to glitz up model heads with stunning head decorations and Diamond Celebration expressed the theme of the exhibition. 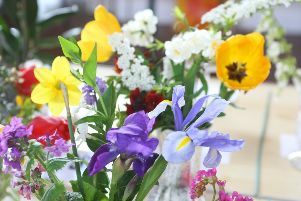 “A display table co-ordinated by Linda O’Connell with arrangements by a number of members showed how flower arranging styles have changed over the 60 years since the club began and a foyer design interpreted Littlehampton’s ties with the suffragette movement 100 years ago. “A large tombola organised by Christine Martin raised an excellent £85, which will be added to the final donation made at the end of the year to local charity Cancer United, which is the club’s charity for the year. Members’ expertise is often used for decorating churches – even Westminster Abbey in the past, as well as stately homes and other exhibitions.